Ambedkar University Delhi Admission 2018 - The application process to seek admission in Ambedkar University has started from 21 May 2018. The candidates can now fill the application form and submit the same on or before the due date in order to complete the application process. After receiving the applications, the process of preparing the cut off list will be started based on which the admissions will be granted to the candidates. The last date to fill the application form of Ambedkar University Delhi is 5 July 2018. The university will release the first cut off on 9 July 2018. Ambedkar University is a unitary non-affiliating university which offers undergraduate as well as postgraduate courses. 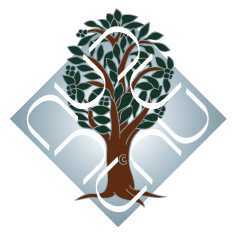 Bharat Ratna Dr B. R. Ambedkar University or Ambedkar University Delhi (AUD) was established in the year 2007 by the Government of the NCT of Delhi and is completely funded by the State Government of the NCT of Delhi. Last year, the AUD received around 26,677 applications for admission in the academic year 2017-18 at Kashmere Gate and Karampura campuses. This page gives the information about the Ambedkar University Delhi Admission 2018 comprising the details about the application form, cut off list etc. Latest Update: The Ambedkar University Delhi (AUD) will release the first cut off today. The first cut off will be available on this page. Ambedkar University offers the admission in BA, BA (Hons) and BVoc courses. This page is focused on BA and BA (Hons) courses. B.A course is offered in Karampura Campus whereas the Kashmere gate campus accepts the admission only for the B.A (Hons) courses. Reservation of Seats: In Ambedkar University, 85% of seats are reserved for candidates from the NCT of Delhi and 15% seats are for candidates outside the NCT of Delhi. The Karampura Campus offers different specialisation in BA programme. Hence, the candidates seeking admission in BA must have passed the Class 12 or an equivalent examination from a recognised Board and secured the minimum cut off marks prescribed by the University. BA (Hons) in Economics The candidates must have passed the class 12 examination with at least 50% marks (relaxation of 5% of marks for SC/ ST/ PwD) from a recognised Board. The candidates must have passed Mathematics which will be counted among the best four subjects. BA (Hons) in English The candidates should have passed class 12 or an equivalent examination, with at least 50% marks, from a recognised Board and at least 65% marks in English. BA (Hons) in History/ Psychology/ Sociology/ SSH The candidate must have passed the class 12 or an equivalent examination from a recognized Board and secured the minimum cut-off mark prescribed by the University. The application process for admission in Ambedkar University Delhi has started from 21 May 2018. The candidates seeking admission in BA programme and BA Hons in Karampura and Kashmere gate campus respectively can now fill the application form on or before the due date. The last date to fill the application form is 5 July 2018. While filling the application form of Ambedkar University Delhi, the candidates have to provide their personal details, qualifying exam details. They also have to upload the photograph and signature and make the payment of the application fee. The candidates can follow the link below in order to apply online. How to fill the Ambedkar University Delhi Admission Form? Many of the candidates while filling the application form end up making mistakes. 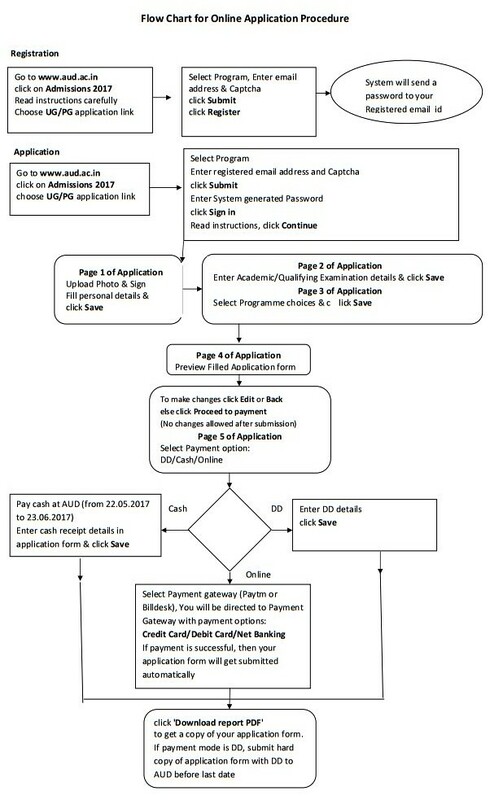 Hence, the flowchart for the online application procedure of Ambedkar University is given below to have the clarity among the students to fill the application form. After successfully filling the application form of AUD, the candidates have to make the payment in order to complete the application process. The candidates can make the payment against the filled in AUD application form via any of the modes given below. By Cash - The first mode to make the payment of AUD application fee is by cash. In order to do so, the candidates have to visit the AUD campus and make the payment. After the payment, the candidates should keep the receipt of the requisite amount. By Demand Draft - If any of the candidates are making the payment through Demand Draft then they must draw DD in favour of "Ambedkar University of Delhi" payable at New Delhi. Thereafter they have to fill in the DD details in the online application form where required. By Online - Apart from these two mentioned modes, the candidates can make the payment through online mode i.e. Credit/ Debit Card/ Net Banking. Once the candidates are done with filling the application form and making the payment for the same, at last, they have to submit the application form of AUD through online mode only. The candidates are suggested to get the printout of the application for of AUD after submission and keep it safe for future use. The application fee of Ambedkar University for General as well as SC/ ST/ PD category is different. The same is available is given below in the tabular form. The candidates are suggested to make the payment for the same as per their category. The payment of the application fee can be made via the modes mentioned on this page. NOTE - Partial and full fee waiver and scholarships are available for UG courses. Candidates admitted under SC/ST/PD categories will be eligible for full fee waiver. The authorities in the Ambedkar University will prepare the admission list on the basis of the marks obtained by the candidates in Class 12 examinations who fulfil the eligibility criteria and seat availability. The first cut off list of Ambedkar University will be released on 9 July 2018. The complete cut off schedule of the AUD is given below.